Jim Tevenan uses his tablet to check on power outage updates and weather-related corrections to the Community Calendar. The single bulb is the only light or heat in the building, powered by a small generator outside. 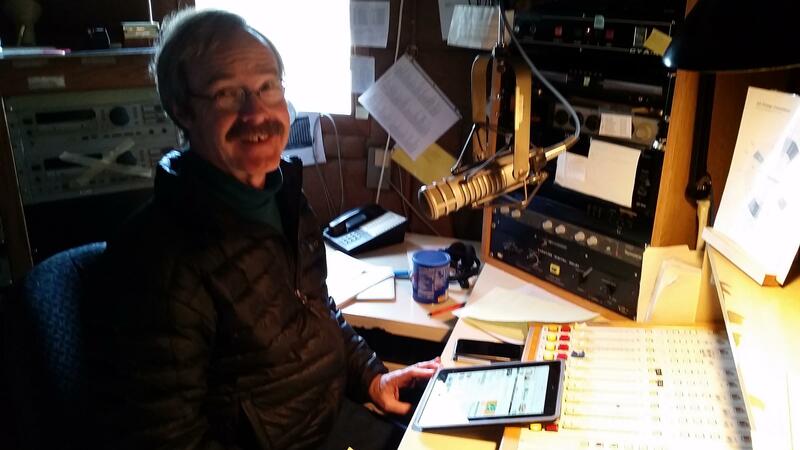 In keeping with this tradition of dramatic openings, our region was hit by one of the largest windstorms in recorded history during the first day of our first pledge drive from the new station—and our first broadcast from the new facility. The situation was dynamic, and information about the storm came to us slowly—but it turned out to be one of the largest power outages in the region’s history. We called the drive off an hour before the end of the first day—and lost power ourselves at both facilities just a few moments later. 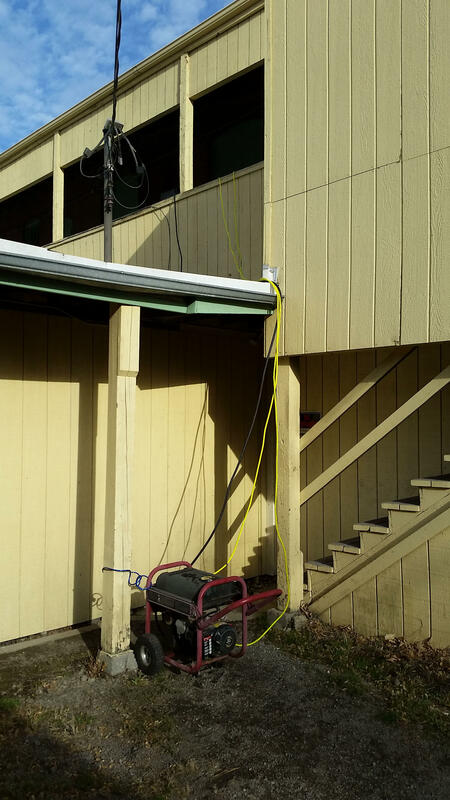 We were without public radio from Tuesday just before 6 p.m. until Wednesday afternoon when our (quite magical) chief engineer managed to power up the equipment using a small portable generator—a situation we hope is temporary until conventional power is restored. The full generator can keep power on for two hours. Jerry Olson put it in a dirt parking strip well away from the doors for safety. Cords wend upward over the lower level roof, over the porch railing and through the door, which must stay ajar. Our signal and service are currently at their most basic, consisting primarily of the NPR network, BBC News, and live broadcasts from the station. This comes from the old facility at 2319 N. Monroe while we regroup, readjust antennas blown out of alignment, and assess the damage. With these things in mind, the on-air pledge drive is suspended. We’ll try to raise operational funds with a “soft” drive (no interruption of programming) through the end of the year, and an end-of-year letter and e-mail campaign, even as we continue the move. Such storms expose vulnerabilities in operations be they at work, at home, or in our communities. As you probably know, Gov. Jay Inslee has declared a state of emergency. Power was lost to more than 350,000 residents. For a day SPR had no phones, lights, heat, hot water, or internet. Many people are still without. We have a large emergency generator but that is not sufficient to keep two facilities alive at the same time. Our systems are coming back online slowly, but we remain vulnerable as long as we are in transition between buildings. It’s critical that we do this as quickly as we can, and get into a single facility where our operations are “hardened” and stable. Ironically, this is one of the reasons we undertook this project—to secure and stabilize our operations to prepare for exactly this kind of emergency operation. Luckily, we are well along in the move to a stronger facility. Unluckily, we were not completely finished when the storm hit. One of the challenges we still face is the last piece of automation equipment. We were hoping to put off the purchase of this last puzzle piece (about $90,000, in addition to the $100,000 we just spent on hardware) until after we had moved. The plan was to operate the new facility at the Fire Station on old machines until we had the money to purchase the updated equipment over time. But they may no longer be usable after the power outage. It may be we can’t put this off any longer, and we will apply for emergency funding and grants to do this as best—and as soon—as we can. We’ll know more when power is restored, and for the moment this affects much or our regularly scheduled programming. For those of you who took a moment to pledge your support or to volunteer on that volatile first Pledge Drive day—thank you for your help and support. It’s even more valuable during difficult moments. Finally, a personal note of thanks to SPR’s talented and extraordinarily dedicated crew. Through sheer remarkable pluck and ingenuity, your public radio service is still on the air—by restarting an old studio, and powering it with a gas-powered generator filled once every two hours beginning at 6am. We’re doing our best to be sure SPR remains on the air for the foreseeable future. I should have more information and further updates soon.